This is SUCH a fun craft for young children to do. There's something about shiny little scales that just cheer my 2 year old daughter right up! Our rainbow fish has a permanent place of honor on the refrigerator. Here is a picture of the Rainbow Fish that Cassidy made. Tip from Val: To make the Rainbow Fish Crafts look underwater, stick it to a blue sheet of construction paper and glue on top one sheet of slightly crumpled plastic wrap. Tip from Terrie: I often teach the 2/3 year olds at Sunday School and last week we did the Jonah story. To simplify your fish craft I used the template for an outline and traced it onto blue construction paper. I cut it out so that the outside was still one piece. We glued the the tissue squares and tinfoil squares onto a plain white piece of paper, and then laid the blue construction paper over top. 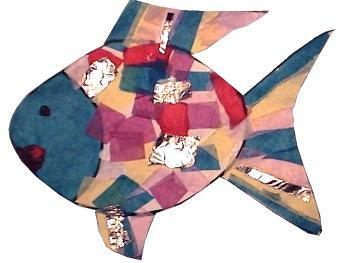 We then had a colorful fish in the middle surrounded by blue construction paper "water"! . The kids loved it, and it was easier for them. color the head in blue, or glue on a piece of tissue or construction paper. It doesn't have to be perfect as we're going to cut out the fish at the end. Cut out along the lines (if you used tissue paper you'll be able to see the lines through it... If you used construction paper, just estimate where the lines are). This step will require adult assistance for younger children.